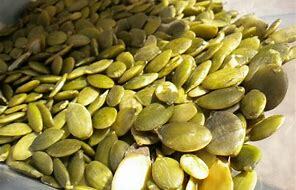 How To Make Your Own: Take raw pumpkin seeds, place in high output blender, food processor, or coffee grinder and grind until fine. Grind for about 5 seconds at a time, then check the consistency by touch, repeating the process until you reach the desired fineness. 1. Place coarsely ground pumpkin meal with salt, Parmesan, oregano and paprika. Transfer to a plate. 3. Coat the chicken lightly with flour, and then dip into the eggs, allowing the excess to drip off. Then coat the chicken in the pumpkin seed mixture, pressing to adhere. Place the crusted chicken onto a plate. Repeat for all the chicken breasts. 4. Heat 1 tablespoon of avocado oil in a wide skillet over medium-high heat. Add the chicken, doing in batches if too crowded, cooking for 5 minutes on each side, or until fully cooked depending on the thickness of chicken.